Why did so few people see Auroras on Friday night? Why did so few people see auroras on Friday night, after all the media hype? You can see one of two reasons in the data. As I explained in my last post, you can read what happened in the data shown in the Satellite Environment Plot from this website (warning — they’re going to make new version of the website soon, so you might have to modify this info a bit.) Here’s what the plot looked like Sunday morning. What the “Satellite Environment Plot” on swpc.noaa.gov looked like on Sunday. Friday is at left. Time shown is “Universal” time (UTC); New York time is 4 hours later at this time of year. There were two storms, shown as the red bars in the Kp index chart (fourth line); one occurred very early Friday morning and one later on Friday. You can see the start of the second storm in the “GOES Hp” chart (third line), where the magnetic field goes wild very suddenly. The storm was subsiding by midnight Universal time, so it was mostly over by midnight New York time. What the figure shows is that after a first geomagnetic storm very early Friday, a strong geomagnetic storm started (as shown by the sharp jump in the GOES Hp chart) later on Friday, a little after noon New York time [“UTC” is currently New York + 4/5 hours], and that it was short — mostly over before midnight. Those of you out west never had a chance; it was all over before the sun set. Only people in far western Europe had good timing. Whatever the media was saying about later Friday night and Saturday night was somewhere between uninformed and out of date. Your best bet was to be looking at this chart, which would have shown you that (despite predictions, which for auroras are always quite uncertain) there was nothing going on after Friday midnight New York time. But the second reason is something that the figure doesn’t show. Even though this was a strong geomagnetic storm (the Kp index reached 7, the strongest in quite some time), the auroras didn’t migrate particularly far south. They were seen in the northern skies of Maine, Vermont and New Hampshire, but not (as far as I know) in Massachusetts. Certainly I didn’t see them. That just goes to show you (AccuWeather, and other media, are you listening?) that predicting the precise timing and extent of auroras is educated guesswork, and will remain so until current knowledge, methods and information are enhanced. One simply can’t know for sure how far south the auroras will extend, even if the impact on the geomagnetic field is strong. For those who did see the auroras on Friday night, it was quite a sight. And for the rest of us who didn’t see them this time, there’s no reason for us to give up. Solar maximum is not over, and even though this is a rather weak sunspot cycle, the chances for more auroras over the next year or so are still pretty good. Finally, a lesson for those who went out and stared at the sky for hours after the storm was long over — get your scientific information from the source! There’s no need, in the modern world, to rely on out-of-date media reports. Auroras — Quantum Physics in the Sky — Tonight? Maybe. If we collectively, and you personally, are lucky, then maybe you might see auroras — quantum physics in the sky — tonight. Before I tell you about the science, I’m going to tell you where to get accurate information, and where not to get it; and then I’m going to give you a rough idea of what auroras are. It will be rough because it’s complicated and it would take more time than I have today, and it also will be rough because auroras are still only partly understood. First though — as usual, do NOT get your information from the mainstream media, or even the media that ought to be scientifically literate but isn’t. I’ve seen a ton of misinformation already about timing, location, and where to look. 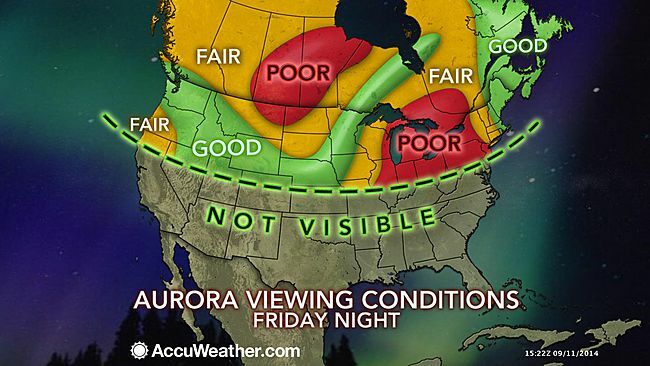 For instance, here’s a map from AccuWeather, telling you who is likely to be able to see the auroras. Don’t believe this map by AccuWeather. Oh, sure, they know something about clouds. But auroras, not much. Auroras aren’t like solar or lunar eclipses, absolutely predictable as to when they’ll happen and who can see them. They aren’t even like comets, which behave unpredictably but at least have predictable orbits. (Remember Comet ISON? It arrived exactly when expected, but evaporated and disintegrated under the Sun’s intense stare.) Auroras are more like weather — and predictions of auroras are more like predictions of rain, only in some ways worse. An aurora is a dynamic, ever-changing phenomenon, and to predict where and when it can be seen is not much more than educated guesswork. No prediction of an aurora sighting is EVER a guarantee. Nor is the absence of an aurora prediction a guarantee one can’t be seen; occasionally they appear unexpectedly. That said, the best chance of seeing one further away from the poles than usual is a couple of days after a major solar flare — and we had one a couple of days ago. The “Satellite Environment Plot” from earlier today; focus your attention on the two lower charts, the one with the red and blue wiggly lines (GOES Hp) and on the one with the bars (Kp Index). How to use them is explained in the text. Media absurdity has reached new levels of darkness with the announcement that Stephen Hawking has a new theory in which black holes do not exist after all. First, Hawking does not have a new theory… at least not one he’s presented. You can look at his paper here — two pages (pdf), a short commentary that he gave to experts in August 2013 and wrote up as a little document — and you can see it has no equations at all. That means it doesn’t qualify as a theory. “Theory”, in physics, means: a set of equations that can be used to make predictions for physical processes in a real or imaginary world. When we talk about Einstein’s theory of relativity, we’re talking about equations. Compare just the look and feel of Hawking’s recent note to Einstein’s 1905 paper on the theory of special relativity, or to Hawking’s most famous 1975 paper on black holes; you can easily see the difference without understanding the content of the papers. The word “theory” does not mean “speculations” or “ideas”, which is all that is contained in this little article. Maybe that’s what theory means at a cocktail party, but it’s not what “theory” means in physics. Second, what Hawking is addressing in this note is the precise level of blackness of a black hole… in short, whether the name “black hole” for the objects we call black holes is really appropriate. But simply the fact that black holes aren’t quite black isn’t new. In fact it was Hawking himself who became famous in 1974-1975 for pointing out that in a world with quantum physics, typical black holes cannot be precisely black — so it’s not true that nothing ever comes out of a black hole. Black holes must slowly radiate elementary particles, a process we call Hawking radiation. From day 1, Hawking’s observation posed puzzles about how conflicting requirements of quantum theory and Einstein’s gravity would be resolved, with quantum theory demanding that all information that fell into the black hole be neither destroyed nor copied, and Einstein’s gravity insisting that there is no way that the information of what went into a black hole can ever come out again, even if the black hole evaporates and disappears. The assumption of the community has long been that the 1970s calculation that Hawking did, while largely correct, leaves out a small, subtle effect that resolves the puzzle. The question is: what is the nature of that subtle effect? No one, including Hawking, has posed a satisfactory answer. And that is why we keep hearing about black holes again and again over the decades, most recently in the context of the “firewall paradox”. In his recent paper, Hawking, like many of his colleagues, is proposing another possible answer, though without demonstrating mathematically that his proposal is correct. But did Hawking really say “There are no black holes”, or didn’t he?? Talk about taking things out of context!!! Here’s what Hawking actually said. First he suggests that the edge of a black hole — called its “event horizon”, a very subtle concept when you get into the details — really isn’t so sharp once quantum effects are considered. Many people have suggested one version or another of this possibility, which would represent a small but critical correction to what Hawking said in the 1970s (and to what people understood about black holes even earlier). Notice the final clause, which is omitted from the media reports, and is absolutely necessary to make sense of his remark. What he means is that black holes are very, very slightly (though importantly) less black than he said in his 1974 paper… because the things that fall into the black hole do in some sense eventually come back out as the black hole evaporates. I say “in some sense” because they come out thoroughly scrambled; you, for example, if you fell in, would not come back out, even though some of the elementary particles out of which you are made might eventually do so. Translation: for an extremely long time, what we call a black hole will behave in just the way we have long thought it does. In particular, there is no change in any of the astrophysics of black holes that astronomers have been studying in recent decades. The only issue is what happens as a black hole begins to evaporate in a serious way, and when you look very, very carefully at the details of the Hawking radiation, which is very difficult to do. In short: In Hawking’s proposal, it’s not that the objects that you and I would call “black holes” don’t exist! They are still there, just with a new name, doing what we’ve been taught they do except in some fine-grained detail. Not that this fine-grained detail is unimportant — it’s essential to resolving the quantum vs. gravity puzzle. But an ordinary person watching or exploring near a black hole would notice no difference. Notice also all of this is a proposal, made in words; he has not shown this with mathematics. In short, although Hawking is, with many of his colleagues, working hard to resolve the puzzles that seem to make quantum theory conflict with Einstein’s theory of gravity in this context, he’s not questioning whether black holes exist in the sense that you and I would mean it. He’s addressing the technical issue of exactly how black they are, and how the information contained in the things that fall in comes back out again. And since he’s just got words, but not math, to back up his suggestions, he’s not convinced his colleagues. Meanwhile, the media takes the five words “There Are No Black Holes” and creates almost pure fiction, fiction that has almost nothing to do with the reality of the science. Well done, media, well done. Sometimes you’re just like a black hole: information comes in, and after being completely scrambled beyond recognition, comes back out again through a mysterious process that makes no sense to anyone. Except that in your case, it’s very clear that information is lost, and misinformation is created. I still have a lot of work to do before I can myself write intelligently about the Fukushima Daiichi nuclear plant, and the nuclear accident and cleanup that occurred there. (See here and here for a couple of previous posts about it.) But I did want to draw your attention to one of the better newspaper articles that I’ve seen written about it, by Ian Sample at the Guardian. I can’t vouch for everything that Sample says, but given what I’ve read and investigated myself, I think he finds the right balance. He’s neither scaring people unnecessarily, nor reassuring them that everything will surely be just fine and that there’s no reason to be worried about anything. From what I know and understand, the situation is more or less just as serious and worthy of concern as Sample says it is; but conversely, I don’t have any reason to think it is much worse than what he describes. Meanwhile, just as I don’t particularly trust anything said by TEPCO, the apparently incompetent and corrupt Japanese power company that runs and is trying to clean up the Fukushima plant, I’m also continuing to see lots of scary articles — totally irresponsible — written by people who should know better but seem bent upon frightening the public. The more wild the misstatements and misleading statements, the better, it seems. One example of this kind of fear-mongering is to be found here: http://truth-out.org/news/item/19547-fukushima-a-global-threat-that-requires-a-global-response, by Kevin Zeese and Margaret Flowers. It’s one piece of junk after the next: the strategy is to take a fact, take another unrelated fact, quote a non-expert (or quote an expert out of context), stick them all together, and wow! frightening!! But here’s the thing: An experienced and attentive reader will know, after a few paragraphs, to ignore this article. Why? The lesson: one has to be a critical, careful reader, and read between the lines! In contrast to Sample’s article in the Guardian, the document by Zeese and Flowers is not intended to inform; it is intended to frighten, period. I urge you to avoid getting your information from sources like that one. Find reliable, sensible people — Ian Sample is in that category, I think — and stick with them. And I would ignore anything Zeese and Flowers have to say in the future; people who’d write an article like theirs have no credibility. On Tuesday, the New York Times Editorial page ran an Op-Ed about dark matter… and although it could have been worse, it could certainly have been better. I do wonder why these folks don’t just call up an expert and confirm that they’ve actually got it right, before they mislead the public and give scientists a combination of a few giggles and a headache. Ok, out comes the professorial red pen. First, a relatively minor point of order. “…the force of gravity in the universe can be explained only by a corresponding amount of mass, or matter…” This isn’t great writing, because mass and matter are not the same thing. Matter is a type of substance. Mass is a property that substance (including ordinary matter, such as tables and planets) can have. Mass and matter are as different as apples and applets. You can read about these distinctions here, if you like. The author is trying to evade this distinction to keep things simple: the more correct statement is that gravity (in simple circumstances) is a force exerted by things (including ordinary matter) that have mass. But here’s the real offending remark: “Some undiscovered mass — dark matter — must exist in order to explain gravity, but no one has seen any traces of it.” Dark matter is most certainly not needed to “explain gravity” in some general way; there’s not one bit of truth in that remark. For instance, the gravitational pull of the sun on the earth (and vice versa), and the pull of the earth on you and me (and vice versa), has absolutely nothing whatsoever to do with dark matter, nor is dark matter needed to explain it. What the author should have said is: since the 1960s we have known that gravitational forces on large astronomical scales seem to be stronger than we can account for, and so either our equations for gravity are wrong or there is matter out there, pulling on things gravitationally, that we cannot see with any type of telescope. The reason the latter possibility is taken more seriously than the former by most experts is that attempts to modify gravity have not led to a convincing case, while the evidence for additional “dark” matter has grown very strong over recent decades. Here’s one of the several arguments that suggest the possibility of dark matter… the simplest to explain. Experts study the motions of the stars in our own galaxy — the star city known as the Milky Way — and also study the motions of stars in other galaxies. [The overall motions of galaxies themselves, inside giant clusters of galaxies which can be found in deep space, are also studied.] Now what we ask is this; see Figure 1. Supposing all of the matter that is out there in the universe is of a type that we can see in one way or another: stars, gas, dust of various types. Then we can figure out, just by looking with a telescope and doing simple calculations, roughly how much measurable matter is in each galaxy, how much mass that matter has, and where it is distributed inside the galaxy. We can next use that information to figure out how hard that matter pulls on other matter, via the force of gravity. And finally — crucially! — we can calculate how fast that pull will make the matter move, on average. And what do we find when we measure how fast the stars are moving? Our calculations based on the matter that we can see are wrong. We find that the stars in the outer edges of a galaxy, and the galaxies inside clusters, are moving much, much faster than our calculation predicts. (This was discovered in the 1960s by Vera Rubin and Kent Ford.) It’s as though they’re being pulled on by something unseen — as though the gravity on the stars due to the rest of the galaxy is stronger than we’ve guessed. Why is this happening? Fig. 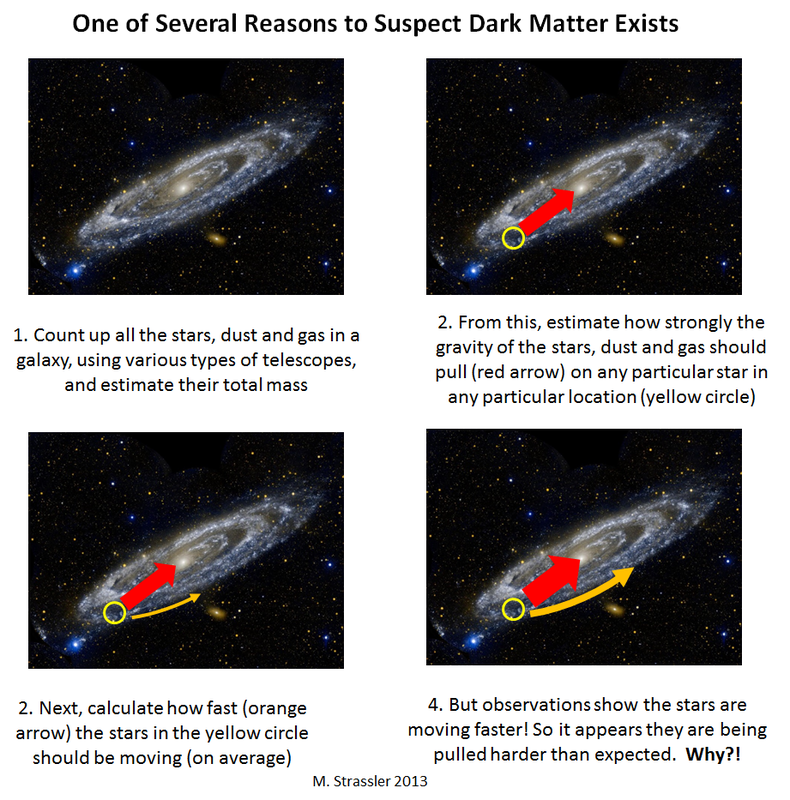 1: One of several lines of evidence in favor of the hypothesis of dark matter is that stars in the outer regions of galaxies move much faster than would be the case if the galaxy was made only from what we can see. One possibility is that there is matter out there that we can’t see, a lot of it, and that matter is inside galaxies and inside clusters of galaxies, exerting a pull that we haven’t accounted for properly. 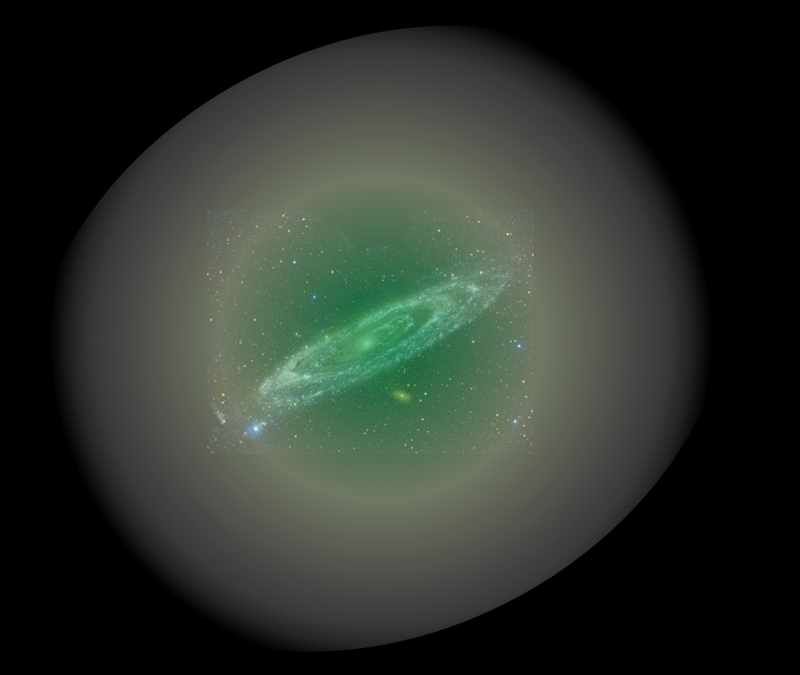 A huge “halo” of dark matter, in this view, surrounds every galaxy (Figure 2). Clearly, this isn’t the only logical possibility. Another option is that there could be something wrong with our understanding of gravity. Or there could be some other new force that we don’t know about yet that has nothing to do with gravity. Or maybe there’s something wrong with the very laws of motion that we use. But all attempts to make sensible suggestions along these lines have gradually run into conflicts with astronomical observations over the recent decades. Fig. 2: The visible part of every galaxy is believed to lie roughly at the center of a much larger halo of dark matter. Meanwhile, during those last few decades, a simple version of the “dark matter” hypothesis has passed test after test, some of these tests being very complex and subtle. For example, in Einstein’s theory of gravity, gravity pulls on light, and can bend it much the same way that the lenses in eyeglasses bend light. A galaxy or galaxy cluster can serve to magnify objects behind it, and by studying these lensing effects, we again conclude there’s far more matter in galaxies and in clusters than we can see. And there are other arguments too, which I won’t cover now. So while an explanation for the fast motion of stars inside galaxies, and galaxies inside clusters, isn’t 100% sure to be dark matter, it’s now, after many years of study, in the high 90%s. Don’t let anyone tell you that scientists rushed to judgment about this; it has been studied for decades, and I can tell you from experience that there’s a lot more consensus now than there was when I was an beginning undergraduate 30 years ago. “Those traces, when they are finally found, will be exotic particles left over from the Big Bang.” Will they? Will the dark matter turn out to be particles from the Big Bang? Not necessarily. We know that’s one possibility, but it’s not the only one. Since I explained this point last week, I’ll just refer you to that post. Now here come the big meta-questions: should the New York Times be more careful about what it puts on its editorial page? Should its editors, who are not scientists, talk broadly about a subtle scientific topic without fact-checking with an expert? What are the costs and benefits when they put out oversimplified, and in some ways actually false, information about science on their editorial page? as though this was contradictory and mystifying. Actually, if you think about it carefully, this is perfectly normal and typical, and not the slightest bit surprising. But to make sense of it, you do also have to understand the levels of “happiness” that the LUX scientists are expressing. The scientists are trying to do the best experiment that they can, in order that their search be as thorough and as expansive as it could possibly be with the equipment that they have available. The scientists are hoping that the thing that they are looking for (or perhaps something else equally or more interesting) will be within reach of their search. Notice that humans have control over the first story. The wiser they are at designing their experiment, and the more skillful they are in carrying it out, the more effective their search will be. But they have no control over the second story. Whether their prey lies within their reach, or whether it lies far beyond, requiring the technology of the distant future, is up to nature, not humans. In short, story #1 is about skill and talent, but story #2 is about luck. Even a great experiment can’t do the impossible, and even one that doesn’t work quite as well as it was supposed to can be fortunate. Of course, there is some interplay between the stories. A disaster in story #1 precludes a happy ending in story #2; if the experiment doesn’t work, there won’t be any discoveries! And the better is the outcome in story #1, the more probable is a success in story #2; a more thorough search is more likely to get lucky. The LUX researchers, in order to make a discovery, have to be lucky in several ways, as I described on Thursday. And they have to interact with ordinary matter at a rate that is not insanely small — no less than a millionth of the interaction rate of high-energy neutrinos with ordinary matter. None of these things is necessarily true, given what we know about dark matter from our measurements of the heavens. And if any one of them is false, no detector similar to LUX will ever find dark matter; we’ll need other methods, some of which are already under way. Now, in this context, what’s the worst thing that could happen to a group of scientists who’ve built an experiment? The worst thing that could happen is that after spending several years preparing the experiment, they find it simply doesn’t work. This can happen! These are very difficult experiments requiring very special and remarkable techniques, and every now and then, in the history of such experiments, an unexpected problem arises that can’t be solved without a complete redesign, which is usually too expensive and in any case means years of delay. Or something just explodes and ruins the experiment. Something like this is extremely depressing and often deeply embarrassing. So if instead the experiment works, the scientists who designed, built and ran it are of course very relieved and reasonably happy. And if, because of a combination of hard work and cleverness, it works better than they expected and as well as they could have hoped, they’re of course enormously pleased, and proud of their work! Now what could make them happier still — even ecstatic, to the point of staying up late drinking entire bottles of champagne? A discovery, of course. Discovering what they’re looking for, or perhaps something they weren’t even looking for, if it is truly novel and of fundamental importance. If that happens, then they won’t care as much if their experiment worked better than expected… because, if you’re an experimental scientist, there’s nothing, nothing at all, better than discovering something new about nature. So with this perspective, I think the LUX scientists’ emotions (as conveyed during his talk by Richard Gaitskell of Brown University, the project’s leader) are actually very easy to understand. They are very happy because their experiment works better than they expected and as well as they hoped… maybe even better than that. For this, they get the high respect and admiration of their colleagues. But make no mistake: they’d certainly be a lot happier — overjoyed and humbled — if they’d discovered dark matter. For that, they’d get a place in the history books, major prizes (perhaps a Nobel, if the Nobel Committee could figure out who to give it to), lasting fame, and the almost unimaginable feeling of having uncovered something about nature that no human previously knew, and that (barring a complete collapse of civilization) will never be forgotten. So yes, they’re happy. But not nearly as happy as can be. They’re frustrated, too, just like the rest of us, that nothing’s shown up yet. However, they’re also hopeful. Since they’ve built such a good experiment, and since they’ve only run it for such a short time so far, they’ll have another very reasonable shot at finding dark matter when they run it for about a full year, in 2014. Not only will they run it longer, they’ll surely also learn, from their experience so far, to be smarter about how they run it. So expect, at the very least, powerful new limits on dark matter from them in eighteen months or so. And maybe, just maybe, something more.